Today in America, radical sexual revolutionaries are meeting nothing but mush as they continue to push through their indulgent sexual agenda on our kids, indoctrinating the minds of the most innocent among us. This revolution cannot grow through reproduction, so it uses indoctrination, which is what we now see in libraries and public schools across the country. 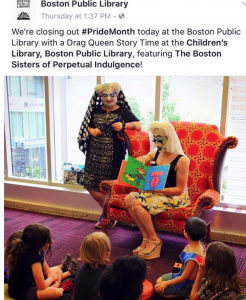 Last month, the Boston Public Library brought in the Sisters of Perpetual Indulgence (they call themselves queer nuns) to read drag-queen stories to children. Of course, you can’t have real nuns teaching honesty, diligence, and temperance to kids in libraries today, but you can have fake nuns (dressed in drag) teaching “a catechism class – an indoctrination session – in the religion of sexual liberation,” as Princeton University professor Robert P. George put it. But we are the bad guys, as one website criticized the Benham brothers for “freaking out” about the Sisters of Perpetual Indulgence reading to kids in a public library. It’s an organization, by the way, that is the embodiment of “genderf—,” as Susan Stryker, a San Francisco gay community historian put it. And these are the guys reading books to America’s children. Does God love these men and those like them who espouse perpetually indulging their “gender—ed” sexual urges, and does He offer them the free gift of salvation? The answer is: Absolutely yes. He loves them all and offers them hope. “Everyone who calls on the name of the Lord shall be saved” (Romans 10:13). But does God also love the ideas these men espouse, cloaking themselves in sacrilege (one “nun” goes by the name of Sister Boom Boom – aka Sister Rose of the Bloody Stains of the Sacred Robes of Jesus) and promoting salvation by sexual self-indulgence to children? The answer is: Absolutely not. The Lord does not look lightly on those who lead kids astray. “Things that cause people to stumble are bound to come, but woe to anyone through whom they come. It would be better for them to be thrown into the sea with a millstone tied around their neck than to cause one of these little ones to stumble (Luke 17:1-2). Thank God Jesus already took the millstone we all deserved and buried it at the cross. Now He offers salvation to any who turn from their wicked ways and place their faith in Him. But it takes people of steel-spined courage to stand up and say this in the face of the indoctrinating bayonet of today’s sexual revolution. Unfortunately, mush is all they’re meeting for the most part. Last month as well, a grown man dressed in drag took the stage at a New York City public school’s talent show, which “included a sexually driven lip-sync performance –including pelvic gyrations and G-string flashes – in front of kids as young as 5 years old,” as the New York Daily News reported. How about this image burned into the minds of your elementary-aged children? Could this, perhaps, be what Jesus meant when He warned of causing little ones to stumble? Can you imagine what courageous leaders from past generations would have said (or done) if a grown man would have disrobed and spread eagle in front of children back in their day? You can rest assured these actions would have met steel resolve. So the question today is: Are there people out there who have steel spines and are willing to stand against this indoctrination of our children? If so, please engage the conversation and ensure this group – the Sisters of Perpetual Indulgence – does not meet mush when it comes to your town. This simply means that, in a nonviolent way, we engage with a compassionate boldness that protects the innocence of children, promotes moral virtue and propositions these people with the only hope for their soul – repentance to the God they so foolishly mock.